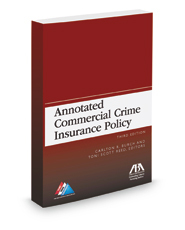 The Annotated Commercial Crime Insurance Policy, Third Edition, published in 2015, provides annotations of all major cases decided based upon the language of commercial crime or mercantile policies, focusing particularly on the most recent standard form policies issued by ISO and FSAA, but also addressing various provisions included in manuscripted language that has become widely used or reviewed by courts. This book provides the most comprehensive review of caselaw decided in the context of the commercial crime or mercantile policies published to date. Moreover, it addresses the most modern provisions, including those related to technology and computer use, that have become widely used. In each chapter, the standard form language of the various insuring agreements, definitions, exclusions, and other provisions of the policies is quoted and cited. Where there are multiple forms of standard language, the alternatives are quoted. A short introductory comment or discussion is included in each chapter to explain the insuring agreement or other provisions covered. Following the standard language, each chapter identifies major categories of decisions reached by courts, and also provides annotations of the specific decisions that interpret the form language. Where nonstandard language has been addressed by a court, there are additional subdivisions within the annotations describing those cases as well. Finally, where the language or provision has been addressed by a court in the context of another type of insurance product, including the financial institution bond, helpful and informative cases are also discussed. As a reference tool, copies of the most recently issued forms of commercial crime and mercantile policies promulgated by ISO and SFAA are included in the Appendix of the book. Cases decided over the last decade are new additions to this edition of the book, but all of the older caselaw that remains relevant or informative is reported as well. The annotations begin with any applicable decisions by the United States Supreme Court, and then include decisions by the Unites States Circuit Courts of Appeals, organized numerically by circuit, decisions by the United States District Courts, organized alphabetically, and finally decisions by the state courts, organized alphabetically and by highest to lowest court. The annotations appear in reverse chronological order, beginning with the most recent caselaw first.